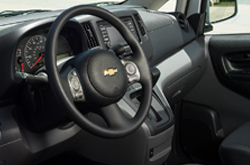 Update: In March 2018, Chevy halted production of the City Express. While City Express inventory is limited, David Maus Chevy offers several other new and used work vans for sale in the Orlando area. The City Express will not return for the 2019 model year. 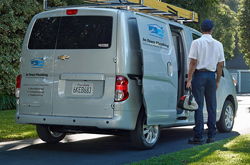 This new addition to the GM family is exactly what the name implies, a city express van. Small on the outside, big on the inside, the City Express is the missing piece between a work truck and a full-size work van. To say the least, this mini-commercial vehicle is convenient, practical, and efficient. The City Express comes in two different trims-LS and LT, with optional features that can be added to its already practical design. Cargo space stands at a total of 122.7 cubic feet, while capable of carrying a 1,500 lb load. 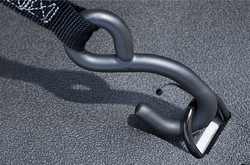 The cargo area measures 82.8 inches from behind the front seat and 48 inches between the wheel wells allowing for accommodation of big objects that can be strapped to the floor's built-in "D"- ring cargo hooks. Loading cargo is no problem with a sliding door on each side and rear doors that normally open at 90 degrees but can extend out to 180 with the pull of a latch. The passenger seat can be folded flat if you wish to use it as a work table and features a hard surface on the back side that faces up when folded. Among other options are body color bumpers, aluminum wheels, and powered- heated mirrors. A touch-screen navigation system with USB connection is available as well as dual 12-volt charging ports and window defoggers. The City Express has many advantages over the classic full-size vans; engineering and design were well thought through- making it easier to maneuver in a city saturated with cars. Its turning radius is less than 37 feet, full length from bumper to bumper is less than 16 feet, and when measured in width comes up to less than 6 feet-making it easier on the driver at narrow streets, parking lots, alleys, and other tight situations. Efficiency in the MPG department is another great advantage. Rated at 24 MPG city and 26 MPG highway, its 14.5-gallon capacity provides mileage in the 348 to 377-mile range per fill. The small footprint City Express is powered by a 2.0L DOHC I4 gas engine, paired with the advanced Xtronic CVT transmission for smooth and efficient acceleration. This combination leads to an outcome of 131 hp and 139 lb-ft of torque. One of the highest priorities at Chevy is safety. The driver and passenger can feel safe, protected by frontal airbags as well as dual side curtain airbags-standard even on the base model. Also standard on both models now is a rearview camera; Rear Parking Assist is standard on the LT trim but optional on the LS. Added safety comes from the optional hands-free Bluetooth, to help you keep your eyes on the road and hands on the wheel while answering calls. *Taxes, title, registration, administrative fees and Dealer Fee of $799.50 not included. These charges represent costs and profit to the dealer for items such as inspecting, cleaning, and adjusting vehicles,and preparing documents related to the sale. Prices include the listed rebates and incentives. Please verify all information. We are not responsible for typographical, technical, or misprint errors. Inventory is subject to prior sale. Contact us via phone or email for more details. *MPG Based on 2018 EPA mileage ratings. Use for comparison purposes only. Your mileage will vary depending on driving conditions, how you drive and maintain your vehicle, battery-pack age/condition, and other factors.